Relyon was established in 1858 initally setting up as a wool merchant in the Somerset town of Wellington. Originally called Price Brothers and Co. after its founders, the business quickly evolved into manufacturing beds. In 1935 the company became known as Relyon to reflect its emphasis on designing beds that you could truly “rely on” for a good night’s sleep. 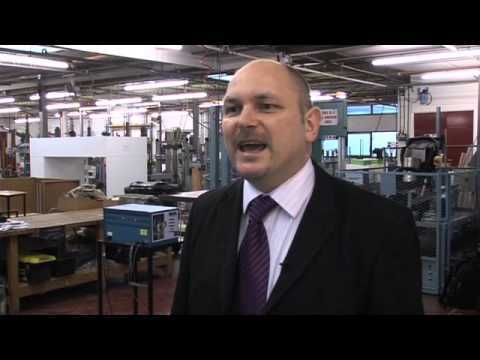 The company's philosophy is still the same today: 'your comfort is our paramount priority'. Relyon's mattresses are hand-made using traditional craftmanship and time-honoured skills that have been passed on and improved upon generation after generation. Today Relyon is a brand name synonymous with the very highest standards of product design and manufacturing quality and it is now recognised as one of the leading UK bed manufacturers. The Relyon Emperor 5' Divan Bed incorporates 3400* Calico pocket springs that are hand nested in two layers and hand centre tied. 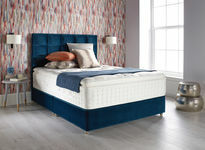 Boasting 5 rows of hand side stitching, the luxurious turnable mattress is hand tufted with wool tufts and comes with sumptuous hand teased natural fillings. 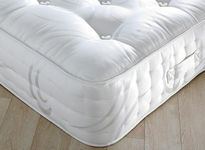 The Emperor comes with a choice of divan base options. 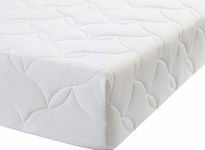 The Relyon Pocket Comfort 1050 4' 6" Roll Up Mattress combines 1050 pocket springs with superflex foam for superior comfort. Finished with a COOLMAX® fabric, this roll up mattress is suitable for all types of divan and slatted bases, and is easy to transport and quick to unpack. 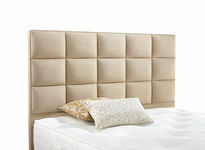 The Relyon Baronial 5' Divan Headboard is a sleek and sophisticated upholstered headboard featuring vertical panelling. Available in a wide selection of fabric finishes, this model also comes with a choice of style: bed fix and extra height slim (floor standing). 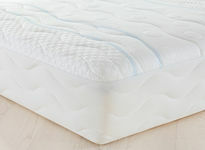 Here at Dalzells we’re proud to retail a wide selection of Relyon Beds and Mattresses. Relyon Beds come with a choice of divan base options so you can personalise your bed to suit your needs. We offer all our customers the very best deal and unbeatable service from our highly experienced, Sleep Council Approved team! We'll also Deliver your new Relyon Bed for Free and Recycle your old bed throughout Northern Ireland and Counties Dublin, Louth & Monaghan. We’ll even remove & Dispose of Packaging and assemble your new divan bed and mattress in a room of your choice and provide you with Free Pillows. Delivery is also available at competitive rates throughout the rest of Ireland. With additional discounts for Multibuy, and our Price Promise, you can be sure you're getting a great deal because we appreciate your business! Call, Email or Visit Us In-store.